I think it's only dimension sets here as well, but recent waves as well. well, they are at least 30% off everywhere else, no? surprisingly, germany has a similar selection of sets on sales to the UK. I was thinking the same thing, but I'm not certain the Mini Beetle promo will last that long. I hope they have a large stock @Wijnegem, though I'm not holding my breath. I got my Mini Beetle @ Wijnegem last tuesday, and I've read on another forum that they still have quite a few in stock today. So I'm guessing you'll still be able to get one in the coming days. Hothbricks.com is saying that the set that will be 40% off on May 6th is Battle on Scarif, as teased by lego. From today they will reveal what sets will be 40% off and when each day (seems they're working backwards, so tomorrow we should know for May 5th, then May 4th etc). I was planning on getting Scarif for this May the 4th event but am now worried if I leave it till the last day the R2 poly will be sold out. Do you think the quantity of these freebies available are the same regardless of period? The beetle lasted most of its time and that seemed pretty popular (and had a lower purchase threshold too). 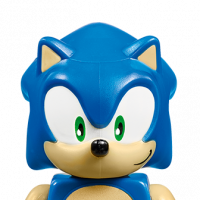 There is a list on promobricks of all 8 sets. Not sure how accurate it is but the Battle of Scarif set is the only set that I will be after if it's correct. That rebel battlepack is a good price, but I'm definitely after Scarif now!!!! Just hope the promo does not run out. "Celebrate May 4th and 40 years of Star Wars™ from 29th April to 6th May with our unique offers. Come back daily to get all the details!" Really want Battle of Scarif (also like the blue X-wing), problem is I am away from home the coming month or so, and I don't know how convenient it will be ordering something while in France, and have it delivered to my temporary 'place of residence' in France!?!? We will have to see and wait to find out if the link @bandit778 posted has them all correct!?! Any way, I have the AT-ST Walker as well as the Rebel battle pack. Both (for different reasons obviously) are really nice sets! The MF too is definitely a great bargain at 40% off. I was really hoping #75158 Rebel Combat Frigate would be among the sets discounted 40% . I really really want that set, mainly because of two nice minifigs in it which are exclusive to this set (Ashoka & Sato), and I love to have and add to my SW Rebels collection. However this set is at a whopping €140 waaaay too expensive, and the ship itself (especially at that price) is not that appealing and well designed I think. So I will probably pass on it unless I can find it somewhere for a good bargain. Lets hope Ahsoka at least will be included in the future in another set, a set not as expensive as this one. ^ maybe the best thing is to just get it delivery to a family or a friend's home in the Netherlands, unless you have a pretty fixed address in France for a while? If you are worried about not being able to order while traveling, just send me a PM and I'll do it for you. Already got scariff so don't need to order it for myself. Thanks, you are toooooo kind! I will keep it in mind. Isn't it odd, that in France the daily offers are discounted 30% instead of 40% like in (I assume) most other countries? Also, I've been comparing French [email protected] prices with those in the Netherlands, and all I can think is the differences for the most part seem so random and haphazard. @TheBigLegoski in Belgium too. Our RRP already much higher and then the extra discount lower,bit frustrating in my opinion. It is really nice though that the Death Star is also discounted 10%, however, no way will I order that set now while I am in France. It is too impractical, and beyond my alloted Lego budget a.t.m. too. Is there a current 30/40% off list to be found anywhere? Is there anything known on June promos? If nothing I want I'd rather get an extra r3m2 before end of may. @scoiltreasa There's no freebies announced for June on the EU May-June store calendar. There's only the calendar voucher for the Duplo surprise June 01-30 announced. I didn't see any rumours about other promos yet either. Sweet, that's loads of Duplo for the kid's toy box/small pressies. Yay for the calendar! Batman CMF offer no longer available in Glasgow store. All of their stock sold already. I asked Wed 31st May. ^ The signage for that offer was down in Metrocentre also, which didn't bother me seeing as they didn't have a Saturn V to tempt me. Would have made sense to offer #5004932 Travel Building Suitcase, but maybe we'll get that after the summer, when everybody wishes they still were holiday? I don't know about the other stores, but on the BE/NL webstore the Piggy Bank is not available yet. Someone pointed me to the fine printing of the pdf calendar regarding this issue. It turns out that the piggy bank will be exclusive to the Lego store(s) until July 9th. So at least here in the low countries you won't be able to combine the piggy bank and double VIP points online, since you have to wait until July 10th to get the former. @Humdrum yep I noticed the same! 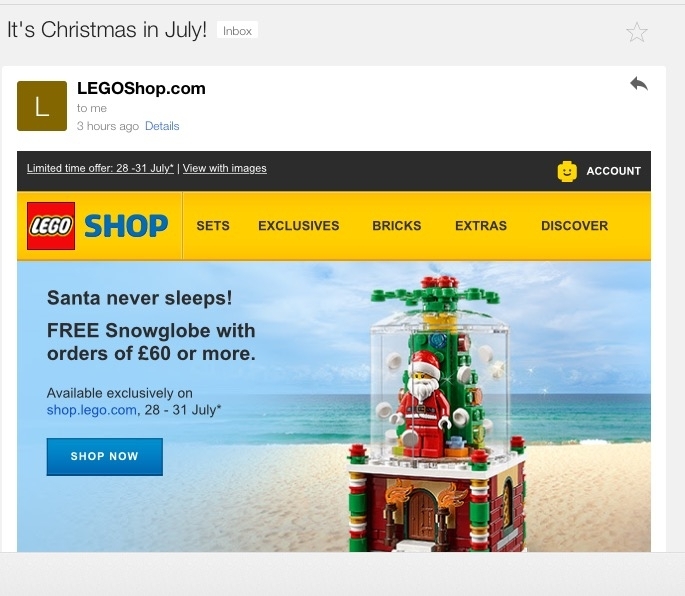 Very frustrating especially as I don't have a lego store here where I would be able to combine the promotions! TLG seems to be bridging the gap between the Mini Piggy Bank GWP and Iconic Cave with some leftover #40223 Snowglobes. Free when spending EUR65/GBP60 or more. [email protected] is a bit inconsistent about offering this GWP: for the moment it only gets added for the AU/DK/DE/NZ/GB shops. Fingers crossed this is just a case of the hamsters powering [email protected] taking a nap, and it will get fixed soon. No date to be found indicating how long this promo will run. LEGO® Snowglobe (item 40223) offer is valid for orders online at shop.LEGO.com only, from 28th to 31st July 2017, or while stocks last. *Sigh* They manage to put a date in the email, but not on the website?! I have no clue how Lego manages excess stock of these promotional items, so forgive my ignorance. Unexpectedly I received this set last year after the official promo term had allready ended. I went to the store in Wijnegem (Antwerp, Belgium) to get my 2017 calendar and the staff said they were giving away the additional stock of this set (with qualifying purchases). Of course they could've been talking about their own local stash, I hope that my fellow AFOLs in the low countries/Luxemburg also get a shot at owning this nice freebie. The Antwerp store often gives away freebies outside their official promo term. Conversely, they sometimes run out of some freebies very early on. Both are related to their local stock I'd say. 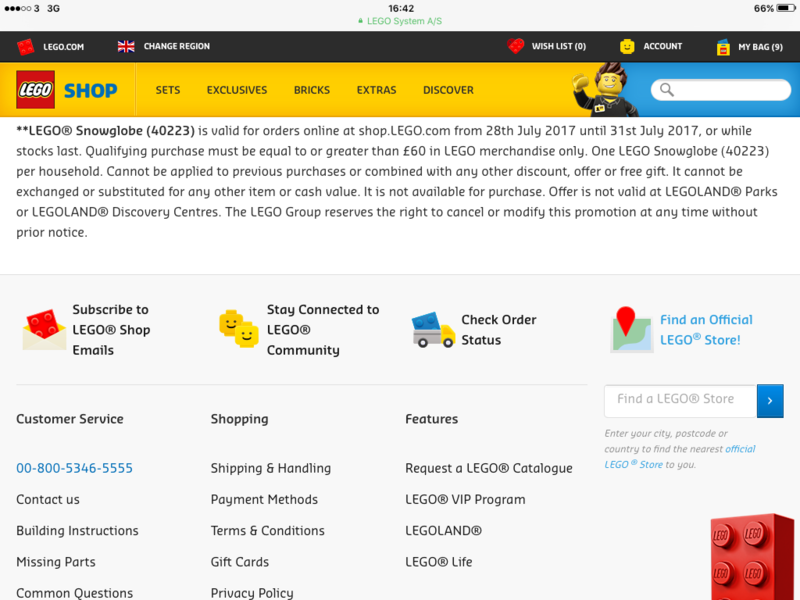 Lego probably doesn't want to ship promo items back to the mothership so they just keep giving them away until stock is gone. Also explains why this promo is online-only, and possibly only for countries whose distribution centers still have the snowglobes (and it seems Geel isn't one of them, so NL/BE misses out once again). It will be a local thing. Stores can often find a polybag from a promo that officially ended the week before when asked if they think it will help them secure a decent sale to a customer. @Huw can you add this to the [email protected] promotion calendar please? No decent promos over this weekend? Looking to buy the Disney castle. manager said the starting date is not decided. Not only HothBricks but also Promobricks is reporting that #5004916 Kai's Dojo Pod will be free Aug 14 - Oct 29 when buying any TLNM set; no minimum purchase required. Both sites are pretty good at reporting upcoming [email protected] promotions, so I'd be surprised if they both got it wrong. The US Store Calendar for September is showing #40176 Scarif Stormtrooper for Force Friday II and some nice TLNM polybags (#30428 Green Ninja Mech Dragon and #30609 Lloyd); fingers crossed we get these in Europe as well. I'll be picking up the lovely sand green ninjago movie dragon on the 14th so it seems. I'll keep picking up the key chains from TLNM for my September and October orders to get more pods. Hopefully heads and hairpieces for ninja are available on bricks and pieces meaning I won't have to hunt all the training outfit sets. Sooo... does a CMF count as "any TLNM set" ? @sid3windr hadn't even considered the cmf! No actual store here so still need to spend 55 for free shipping but a couple extra cmf could work for me! Does a Ninjago Movie keychain counts a purchase? Would be nice to get a keychain (or CMF) + Kais dojo for 'free' with 200 VIP points (unless you want to spend €55 for free shipping). I guess you won't get it with a keychain or CMF, because they're saying "buying a TLNM set". Only from the theme. keychain and CMF fall under another 'theme'.